There are some eels, especially snake eels that are frequently confused with snakes. Look at the photo below and it easily understood why. Not only are the patterns very similar, but the snake eel also moves like a snake. However on close inspection it is easy to tell them apart. 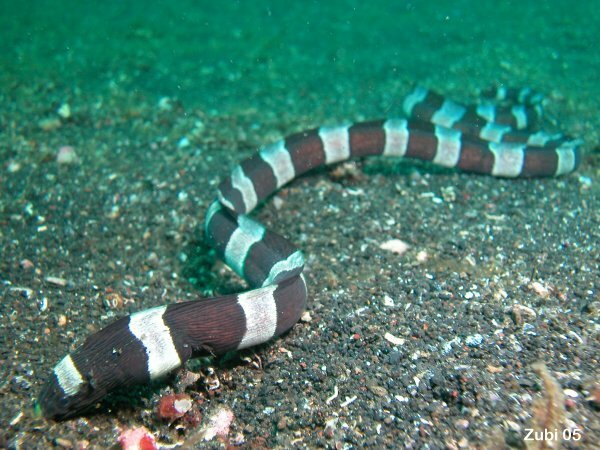 Sea snakes have scales and no fins on their back. Snake eels have a gill opening behind their head and large nostrils. The Snake eel mimics the sea snake, because this gives them some protection against predators. 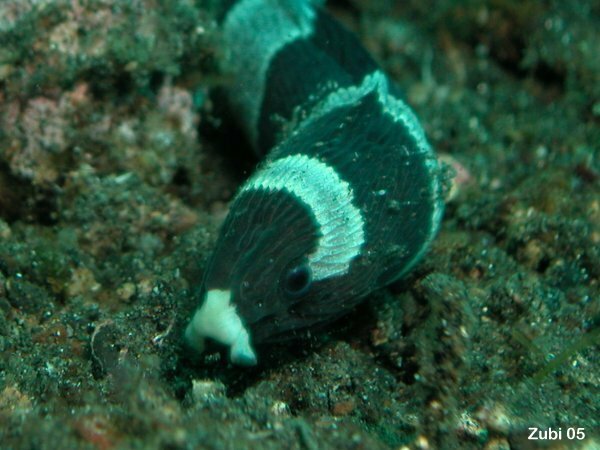 There is a species of sea snakes which looks very similar to the Harlequin snake eel - the banded sea krait (Laticauda colubrina). This photo was taken from 20 cm away. Although seasnakes are highly venomous, they are not aggressive. They are seldom encountered by divers, but sometimes they can be seen swimming to the surface to gulp air (they are airbreathing like us). I was able to observe this banded sea krait for nearly 10 minutes in shallow water. while it was probing crevices and holes in search of small fish. This snake was rather small (under 1m) but sea snakes can grow to about 2 meter.